Terra Forming Terra: Urban Sun Corridor 4 Degrees Warmer? It is a nice number to know and it is important in that it provides us an order of magnitude size measure when we consider other locales. What is missing in everyone's calculations however is just now much this can be ameliorated by the semi dense planting of shade trees in every available corner to produce a local micro climate that is much cooler and much moister. Water is always an issue, but we are going there anyway and putting it all back into the atmosphere through transpiration is a great way to recycle it. This particular corridor cries out for brilliant water oriented ideas. Solve it all here and the whole world will follow. Fill the atmosphere with maximum humidity and we will have down pours at night on most days. In the meantime, one of the hottest spaces in the USA is just hotter because of all that energy dumped to operate air conditioners. We can and will do better and I expect to see us do better. ScienceDaily (Aug. 12, 2012) — According to the United Nations' 2011 Revision of World Urbanization Prospects, global urban population is expected to gain more than 2.5 billion new inhabitants through 2050. Such sharp increases in the number of urban dwellers will require considerable conversion of natural to urban landscapes, resulting in newly developing and expanding megapolitan areas. Could climate impacts arising from built environment growth pose additional concerns for urban residents also expected to deal with impacts resulting from global climate change? 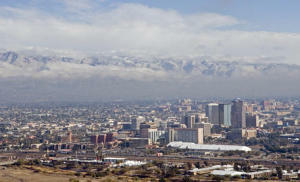 In the first study to attempt to quantify the impact of rapidly expanding megapolitan areas on regional climate, a team of researchers from Arizona State University (ASU) and the National Center for Atmospheric Research has established that local maximum summertime warming resulting from projected expansion of the urban Sun Corridor could approach 4 degrees Celsius. This finding establishes that this factor can be as important as warming due to increased levels of greenhouse gases. Their results are reported in the early online edition (Aug. 12) of the journal Nature Climate Change. Arizona's Sun Corridor is the most rapidly growing megapolitan area in the United States. Nestled in a semi-arid environment, it is composed of four metropolitan areas: Phoenix, Tucson, Prescott and Nogales. With a population projection expected to exceed 9 million people by 2040, the developing Sun Corridor megapolitan provides a unique opportunity to diagnose the influence of large-scale urbanization on climate, and its relation to global climate change. "We posed a fundamental set of questions in our study, examining the different scenarios of Sun Corridor expansion through mid-century. We asked what are the summertime regional climate implications, and how do these impacts compare to climate change resulting from increased emissions of greenhouse gases," says Matei Georgescu, lead author and assistant professor in the School of Geographical Sciences and Urban Planning in ASU's College of Liberal Arts and Sciences. The authors utilized projections of Sun Corridor growth by 2050 developed by the Maricopa Association of Governments (MAG), the regional agency for metropolitan Phoenix provides long-range and sustainably oriented planning. Incorporating maximum and minimum growth scenarios into a state-of-the-art regional climate model, the researchers compared these impacts with experiments using an urban representation of modern-day central Arizona. Their conclusions indicate substantial summertime warming. "The worst case expansion scenario we utilized led to local maximum summer warming of nearly 4 degrees Celsius. In the best case scenario, where Sun Corridor expansion is both more constrained and urban land use density is lower, our results still indicate considerable local warming, up to about 2 degrees Celsius," Georgescu said. An additional experiment was conducted to examine an adaptation where all of the buildings were topped by highly reflective white or "cool" roofs. "Incorporating cool roofs alleviated summertime warming substantially, reducing the maximum local warming by about half," Georgescu said. "But, another consequence of such large-scale urbanization and this adaptation approach include effects on the region's hydroclimate." The cool roofs, like the maximum-growth scenario without this adaptation approach, further reduce evapotranspiration -- water that evaporates from the soil and transpires from plants. Ultimately, comparison of summertime warming resulting from Sun Corridor expansion to greenhouse-gas-induced summertime climate change shows that through mid-century the maximum urbanization scenario leads to greater warming than climate change. However, pinning precise figures on the relative contribution of each effector is difficult, the authors state. "The actual contribution of urban warming relative to summertime climate change warming depends critically on the path of urbanization, the conversion of natural to urban landscapes, and the degree to which we continue to emit greenhouse gases," said Alex Mahalov, a co-author and principal investigator of the National Science Foundation grant, "Multiscale Modeling of Urban Atmospheres in a Changing Climate," which supported the research. "As well as providing insights for sustainable growth of the Sun Corridor and other rapidly expanding megapolitan areas, this research offers one way to quantify and understand the relative impacts of urbanization and global warming,"said Mahalov, the Wilhoit Foundation Dean's Distinguished Professor in ASU's School of Mathematical and Statistical Sciences. The group conducted their numerical simulations using an "ensemble-based" approach. By modifying their model's initial conditions and repeating their simulations a number of times, they were able to test the robustness of their results. In all, nearly half of a century of simulations were conducted. "By incorporating differing Sun Corridor growth scenarios into a high performance computing modeling framework with MAG projections, we quantified direct hydroclimatic impacts due to anticipated expansion of the built environment," added Mahalov. Simulations were conducted at ASU's Advanced Computing Center (A2C2). Georgescu said that one take-home message from this study is that the incorporation of sustainable policies need to extend beyond just greenhouse gas emissions. He also stressed the importance of extending adaptation strategies beyond the focus on mere average temperature. "Truly sustainable adaptation, from an environmental standpoint, must extend to the entire climate system, including impacts on temperature and hydrology," he said.